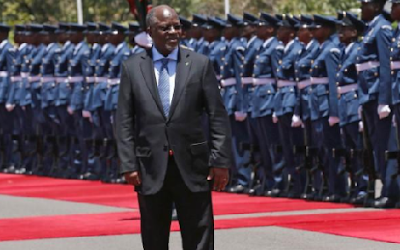 Tanzanian President John Magufuli sacked two senior officials late on Monday after they failed to recall immediately how much money was allocated by the government in their respective districts for public road construction projects. Magufuli, nicknamed “the Bulldozer” for his infrastructure projects and leadership style, launched his reform drive after he was elected in late 2015, promising to transform an economy hobbled by red-tape and corruption and carry out a major building programme. He has sacked thousands of civil servants over the past two years in a crackdown on government inefficiency and corruption. A statement issued by the president’s office said the sacked director of the Bukoba Municipal Council, Erasto Aron Mfugale, and the director of the Bukoba Rural Municipal Council, Mwantum Kitwana Dau, would be assigned to other duties. The president’s office did not explain the reasons for the sackings. However, the two municipal directors were dismissed just hours after the president summoned them at a public gathering and demanded that they announce exactly how much was allocated by the government for road construction in their districts. “You can’t talk to me like that,” Magufuli said at the launch of a new airport in the lakeside town of Bukoba, which was televised live. Dau had informed the president that she oversees many departments and could therefore not immediately recall the exact budget allocated for road projects. Magufuli, who served as the public works minister for nearly 20 years before becoming president, is widely known for having data at his fingertips, and frequently recites monetary figures and exact lengths of roads to their decimal points without referring to notes.